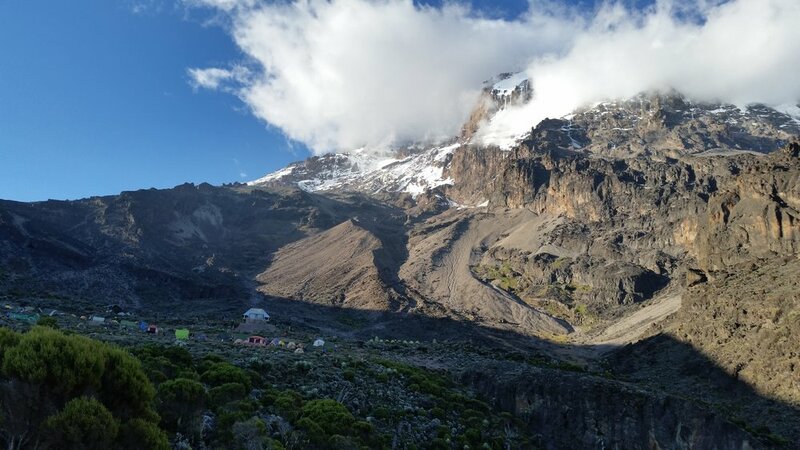 The last camp before the summit on Kilimanjaro's Machame route. Photo by Skyler Awisus. I’ve purchased my flights and cleared my work schedule. This isn’t just another random vacation; today I’ve selected my next mountaineering objective. It’s no longer merely a lofty vision. There is a sense of palpability every time I glance at those chosen days on the calendar. This adventure that has captured my attention for years is coming nearer with each day. In these times of alpine anticipation, the wise will prepare and capture each valuable minute. During these months of expectation, live intentionally and seize each moment instead of just patiently waiting. Out of respect for the peak and this unpredictable endeavor, internalize the history and topography of the range, prepare physically, and familiarize yourself with the language and culture of those who steward the mountain. Anticipatory study and preparation are some of the most rewarding pieces of mountaineering. First and foremost, study the topography and the history surrounding the mountain range. This will refine your understanding and provide a foundation for your future preparation. It helps to comprehend the role that the peak plays in the local folklore of the host country. Begin your research with questions. What do the locals call the peak? Is it considered sacred ground? Who was the first to reach the summit? How did they do so? Where are the topographic danger zones? What are the seasonal weather patterns during this time of year? What routes are considered the most beautiful? Questions such as these will help frame the mountain as you begin planning your ascent. With the spare time prior to the climb, read the stories of those climbers who came before you. Before even stepping foot in Tanzania, I was fascinated by the narratives of those who had climbed Mount Kilimanjaro and were awed to tears at its sight. This intimate understanding will anchor your preparation. Workouts during the strengthening phase of a climbing trip are focused and immediately rewarding. What was once a mundane exercise is now a significant pursuit that will pay dividends at altitude. The physical suffering is still present during hill sprints and grueling mileage on the trail but upon completion you're better prepared to perform in the midst of austere alpine conditions. Depending on the objective, the training you struggle through today can make or break your climb. My Kilimanjaro training plan was based upon skiing as much as possible in Colorado, hiking the 2,744 steps (2,000 ft of elevation gained in 0.88 miles) of the Manitou Springs Incline trail dozens of times, and a lower-body intensive gym routine. This plan allowed my crew to thrive and thoroughly enjoy our time on the 19,341 ft Tanzanian volcano. As Adam (my brother) and I train for our next trip, two peaks in Bolivia’s northern Andes, our motivation is bolstered by the unknown physical stressors that we will soon confront. The fear of being the weak link on a rope team fuels my fire. The goal of cruising past the 19,000 foot marker sustains my will to train early each morning. We found our “why” and it continues to motivate both of us during our grueling preparation regimen. If you are looking for ideas on how to go about building a high altitude training plan, I’d recommend, Training for the New Alpinism by Steve House and Scott Johnston. Intentional training in pursuit of a goal is by far the most sustainable way of exercising. The physical pursuit of climbing mountains across the globe rewards you with the opportunity to totally immerse yourself in a fascinating foreign culture. This cultural immersion doesn’t begin when you hand your passport to the customs official, it starts when you study the social norms, history, and common greetings of the host nation. Your ability to connect with your local guides is exponentially more effective if you can speak a few phrases of their native tongue. It reflects a sense of true humility and respect. I’ll never forget my guide's beaming smile after I greeted him in his native Swahili. Personally, Kilimanjaro was a cultural climb. I spent hours talking to my wise elderly guide about Tanzanian hopes and dreams. Luckily I possessed a framework of understanding for some of the major political movements and figures in Tanzanian history. Our conversations strengthened my understanding of Tanzania’s diverse political landscape and society. I capitalized on my first trip to Africa because of my openness, curiosity, and hours of self-study before the trip. When climbing mountains, never forget that they are so much more than just objectives of rock and ice. In life we often focus far too much on achieving the end goal. So much so, we miss the journey. I’ve seen people make this mistake all too often in mountaineering. The endeavor of climbing is about the entirety of the expedition, not just those fleeting moments upon the summit. Enjoy all aspects of the climb, including the anticipatory period prior to the ascent. Live intentionally and take proper care to prepare yourself mentally and physically. On the summit, you’ll be glad you did.